As we prepare for the opening of our new Life Enrichment Center, it’s time for us to start hiring dynamic new team members that are going to help us bring it all to life. 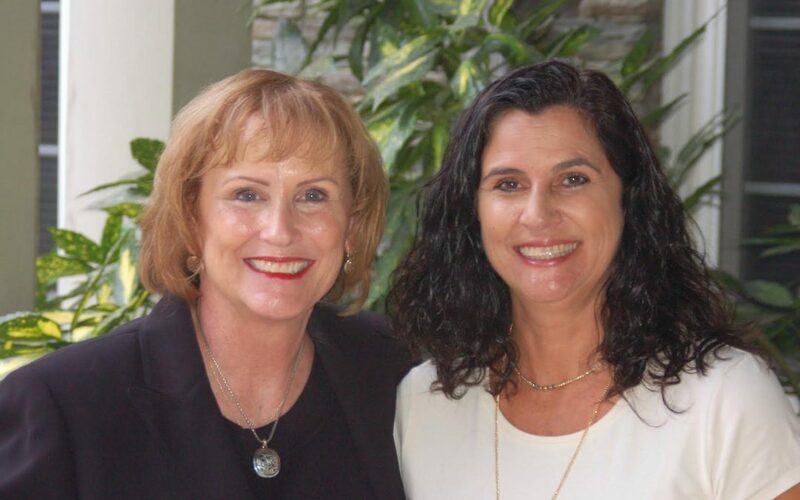 We’re excited to introduce to you Terry Ritchie, RN (left) and Tracy Dunham (right). Terry is our new Center Director and Tracy is our new Operations Manager. Please join us in welcoming both of these ladies to our PCH family! Terry Ritchie came to Georgia via Las Vegas, NV, but is a Southern California native. She lives in Loganville in a 100-year old house with her fur babies, Murphy, Ralph and Hope. Terry is very proud of her two grown children. Her daughter, Katie (28) and son-in-law, Benjamin live in Austin, Texas and her son, Trevor (23) is a U.S. Marine stationed at Camp Pendleton in California. Terry earned her BSN degree from Mount Saint Mary’s College in Los Angeles. She has served as an RN for more than three decades in the specialties of pediatrics, trauma, surgery and hospice nursing. Terry has worked in both for-profit and not-for-profit environments, but truly feels “called” to serve in the non-profit setting. She believes strongly that the patients’ needs should come before profit and that every patient deserves the highest level of care possible. Outside of work Terry enjoys photography, gardening, hiking and visiting her kids. She is known to be an “exemplary” chocolate chip cookie baker and has been nominated, twice as the March of Dimes, Nurse of the Year. Terry is an active member of Grace New Hope Church in Loganville. Tracy Dunham is originally from Cincinnati but has lived in Hoschton since 2001, so Georgia is now “home.” It was her husband Todd’s job that brought them to Georgia. He works as a SE Regional Manager for a camera manufacturer. They have a 19-year old daughter, Cierra that is a sophomore at UGA, a son, Bradley (18) that is a freshman at UGA, and a precious pup that completes their family. Tracy brings to PCH a wealth of professional expertise in accounting, tax compliance, bookkeeping, property, estate management, and law. She is excited to channel her breath and depth of experience to further the mission of PCH. Tracy is a self-proclaimed “organizational guru” that loves to create new policies, procedures and ensure that everything has its place. She’s the type to roll up her sleeves, dig in, and figure out how to get things done. As new empty nesters, Tracy and Todd are learning the joys of a slower pace, relaxing by the pool, taking long walks, volunteering and hanging out with family and friends. They are active members of Hamilton Mill United Methodist Church where Tracy has served on the finance committee for numerous years.